The articles on this page will cover my Cadmium Morph breeding project as well as other snake related experiences I have. Back in 2017 my 2013 male developed milky eyes. This happens sometimes if snakes donm’t properly shed their eye-caps. 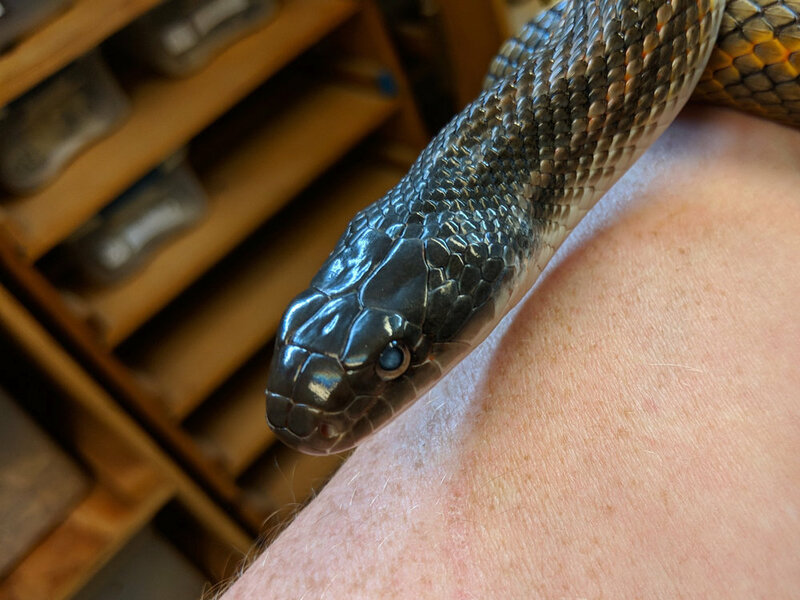 In young snakes it can be a big problem because there’s a gap for bacteria to grow and cause infections and it’s aporblem that can compound itself with each additional shed. trust me, I’ve peeled a bunch of eye caps in my day. A towel soaked in warm water and a pair of tweezers will fix them up real quick. This guy didn’t seem to have retained eye caps. So, I let it go for 1 shed cycle to see what happened. One eye cleared up a lot but the other stayed about the same. His half sister was the same way and I was interested in calm babies, so it made sense to add this par to the breeding pool. But the other day I was cleaning his cage and noticed something. He never strikes. He never jumps. He never recoils. He never makes a jerky motion (without being touched) AT ALL. I thought about this for a minute and then did some tests with waving things at him and making quick gestures around him. he never reacted. I tried shining light on hm and blocking it out. very little pupil activity and no snake reaction. I tried these same motions and gestures with other snakes. All of them flinch or react at some point except him ….and his half sister….. They do not follow fingers or food without their tounges guiding them. so now I face the ethical question: Do I breed them? I tried last year but got nothing. Maybe they are infertile as well. There are a lot of “maybes” to this one but I thought about it and decided to give them one more go. C) They don’t have any babies again? Well, my faithful fans, I was raised on a farm and you don’t feed what you can’t eat or doesn’t work. I know it’s heartless and cold blooded of me but this may be where this branch of the family tree ends.